Providing food for meetings has become a norm, set in line with old traditions of eating during social gatherings and occasions. Generally speaking, I advise people to take a break from their work to eat. You need around 20 minutes to feel the effect of food, that is to feel full and rushing or eating mindlessly can lead to over eating. Ask, do we really need to eat during the meeting? Does this meeting have to happen when people are eating? Respecting meal times allows you to take a break and come to your meeting ready to work. Standing and walking meetings also provide an option for a healthy alternative. Sometimes you just have to meet at lunch or over afternoon tea, when refreshments are expected. The key is to make time to eat by separating when you eat and when you work. A mid-meeting break allows attendees to digest the information discussed, socialise and eat more mindfully. The best way to do this is to provide a buffet in another room, or have one brought in for the break. This avoids people being distracted by the food. We all know salt can raise blood pressure, but recent research is showing that it can also reduce the levels of good bacteria in our gut, especially Lactobacillus. This change in the digestive system can subsequently reduce energy and focus. Salt’s dehydrating effect can also lead to headaches, irritability, drowsiness and confusion, which can reduce attendees’ performance. Long term, high salt intake and low fibre diets can also provide a 25% greater risk of developing depression. Carbs aren’t inherently bad, in fact the National Health and Medical Council recommend that they make up around 45%-65% of our diets, we just need to focus on the right ones. 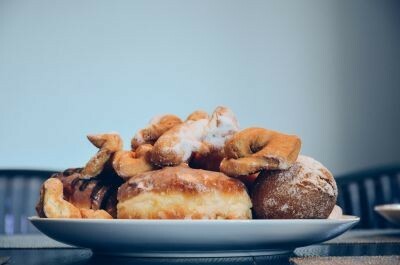 Muffins, bread, cakes and soft drinks all contain simple carbs that breakdown quickly creating blood sugar spikes and immediate energy, however this quickly wears off leaving us in a carb crash reaching for more sugary snacks. As with protein, fats take longer to break down, providing more constant energy levels, keeping us fuller for longer. This doesn’t mean you can pile it on, it’s still important to find natural sources such as avocado, raw nuts and dairy options that aren’t crammed with salt and carbs. Energy levels are built over time through our daily routines, so while there are some quick fixes, it’s important to also look at your overall nutrition, sleep, stress and other factors. With meetings now taking up more of our working life than ever, it’s time to add health to your agendas.